In Monday's post, we talked about the different kinds of fats, and the three categories of them. There is good news and bad news about fats. Today, let's start off with the bad news and end on a better note. Fats can be divided into 'good' or 'bad' fats, depending on whether they help or harm the body. Saturated fats and trans fats are considered 'bad' fats because they cause changes to your body which increase cardiovascular risks. Saturated fats increase LDL ('bad' cholesterol) and triglyceride levels (a type of fat converted from excess calories and stored in the fat cells), raise your blood pressure, and narrow your blood vessels1. Trans fat, or partially-hydrogenated vegetable oil, is considered to be even worse for your health, because it raises your 'bad' (LDL) cholesterol while lowering your 'good' (HDL) cholesterol, a combination which increases the risk of heart disease even more2. 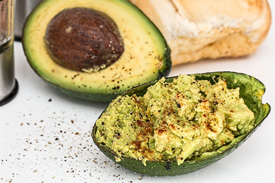 These foods contain higher levels of 'bad' fats. You should be careful to moderate your intake of them. When information came to light about the health effects of trans fat on people, some producers of these foods developed new, trans fat free, formulations of their products. Unsaturated fats are the good guys here, having been shown to lower blood pressure, improve lipid levels, decrease LDL ('bad' cholesterol) and increase HDL ('good' cholesterol), all of which improve cardiovascular health3. Studies also suggest that eating unsaturated fats, or 'good' fats, may decrease the risk of type-2 diabetes4. We are encouraged to choose more of these fats.